Afraid of losing patient personal valuables? Worry no more!! Valuables wallets made of vinyl coated nylon scrim for durability and longevity. Valuables wallets come with brass locking zippers and clear ID pockets. Perfect for use with either small padlocks or security seals. Available in red or frosty clear. 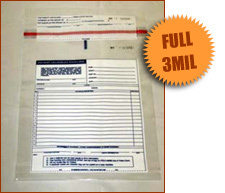 Another great product from Basic's line of Inmate Property Bags. Give us a call!